The Crowne Plaza in San Diego is a California venue with style. All of your event arrangements will be cared for with ease. Set amidst tropical palms and lush, inviting gardens, the Crowne Plaza San Diego's intimate atrium setting is the perfect place for your stay in the heart of San Diego. You'll enjoy your favorite dishes and beverages at the Crowne Plaza San Diego. The choice is yours from The Islands Restaurant, The Islands Sushi & PuPu Bar to the Kona Café. With a fresh look and upgraded amenities, the new Crowne Plaza is the ideal backdrop for your vacation, weekend getaway, business meeting, wedding and reception or social event large or small, formal or casual. 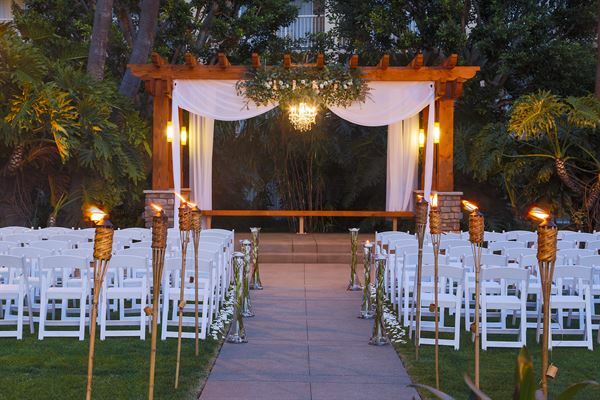 The Crowne Plaza San Diego – Mission Valley is like no other venue as we offer our lush, romantic Hanalei Courtyard, cascading waterfalls, and a selection of elegant ballrooms. Our wedding packages provide you and your guests a variety of options; from our Award Winning Sushi to our delectable Dessert Stations! Your special day can be as unique as you! Our team will ensure that you feel our warm spirit from the beginning to the end – as we create the wedding of your dreams! The Grand Hanalei Ballroom has 6,441 sq. ft. of flexible space. The Grand Pacific Ballroom has 2,130 sq. ft. of flexible space. The Kona Coast Ballroom has 3,816 sq. ft. of flexible space. The Lahaina Bay Ballroom has 2,780 sq. ft. of flexible space. The Peacock 1 Room has 1,376 sq. ft. of event space. The Peacock 2 Room has 1,632 sq. ft. of event space. The Paradise Room has 1,380 sq. ft. of event space.